Exactly 12 months ago today the Mayor of Randwick Noel D’Souza, broke ground on the new Coogee Beach toilet block. I am happy to report that these new facilities were un-officially opened 360 days later on Friday September 1st 2017. The first day of spring. The discomfort to beach regulars and the interruption of the foot traffic flow along the upper and lower promenade right in the middle of Coogee beach is a distant memory. 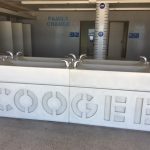 I’ve been watching the evolution of the site and my almost daily hop, skip and jump along the lower prom and the detour around the street level construction zone sensed that this simple toilet block would be another jewel in the Coogee crown. The spring weather on Fathers Day saw people out in droves. They were happy to use the new facilities. I had to try ’em for myself. The plumbing is state of the art. The hand wash facilities at the front of the change room with electronic sensor taps that spit water into the free form basins when they detect your hands in range, compliment the soap dispensers. The showers in this open public area are all push button. I tried one and had my shirt sleeve soaked by the instant arrival of fresh H2O from the water saving shower head. Mums and Dads will be able to rinse off and have their kids do the same without having to go into the change rooms and toilets dedicated to both sexes. I didn’t venture into the ladies but the mens change room is great. 5 low maintenance stainless steel WCs with concealed water saving cisterns and an easy to maintain urinal about 5 metres long with 5 additional showers and plenty of clothes hooks and seating to get changed before and after swimming are features. 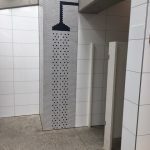 The entire area can be easily washed down and the beautiful polished concrete floor and the brightly tiled walls will help keep the facility sparkling. 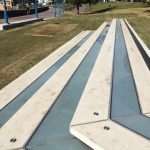 During my roaming the freshly laid turf in the park above, I had wondered about the new concrete seating and the glass panels set into the ground there. I’m pleased to say they are skylights for the change rooms below. Well done Randwick City Council.